Maccabi Electra Tel Aviv continued its hot run in the second-half of the Top 16 by taking down reigning champion Olympiacos Piraeus 67-73 Friday night at Peace and Friendship Stadium. It was the fifth straight win for the Israeli champs – and fourth on the road – to improve to 7-5 and into a four-way tie for second place in Group F. Olympiacos has the same record, as does Montepaschi Siena and BC Khimki Moscow Region. Maccabi never trailed, pulling away to 13-21 on David Logan’s hot shooting at the end of the first quarter and extending the lead to 18 at halftime. When Ricky Hickman gave the visitors a 39-54 lead late in the third quarter, it looks over for the Reds. 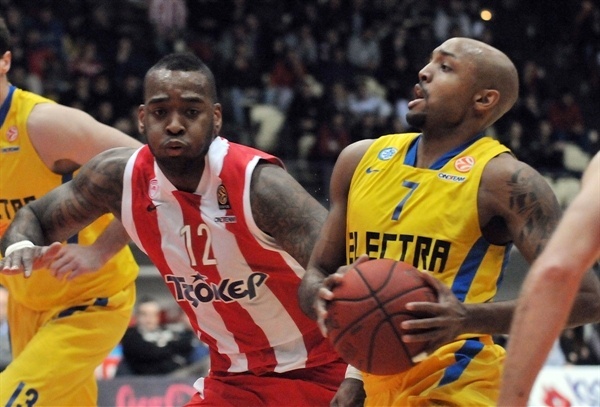 However Vassilis Spanoulis ignited a 14-2 run and set up an interesting fourth quarter. 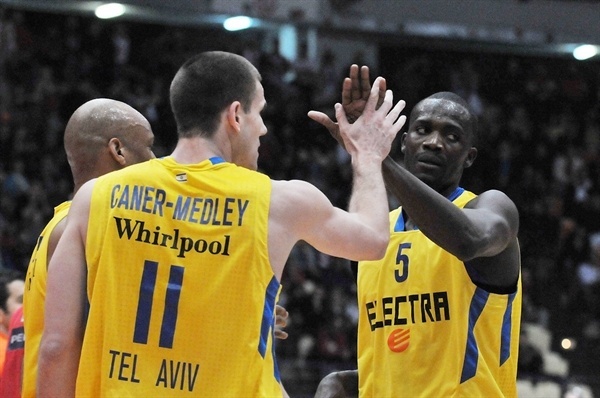 However Maccabi stood tall on defense, protected the lead and held on for a critical victory. 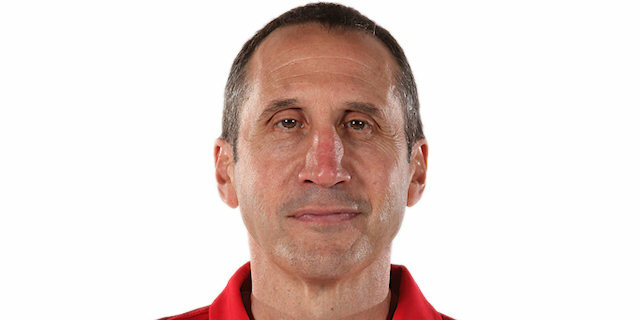 Logan scored 20 to pace Coach David Blatt’s squad, Hickman netted 16, Devin Smith added 13 – including a huge three with a minute and a half to go – and Shawn James tallied 9 points, 10 rebounds and 4 blocked shots. 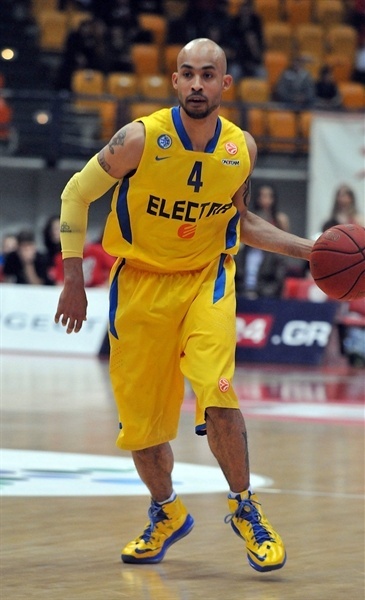 Spanoulis led the Reds with 19 points and Acie Law added 10. Smith banked in a shot for the game’s first points a minute into the game. 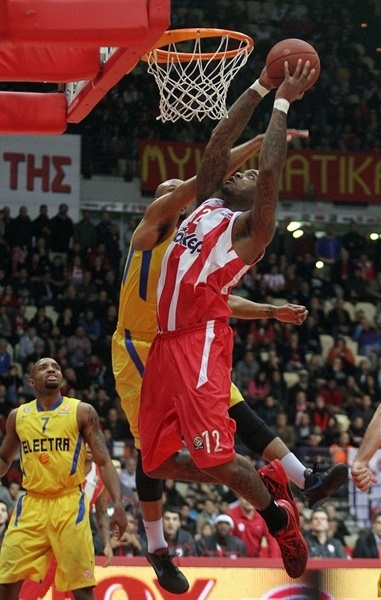 Pero Antic’s slam started Olympiacos soon after. The defenses prevailed early with Nik Caner-Medley and Yogev Ohayon using their speed to make it 2-6, before Antic soared in with a fast break slam to tie the game. Ohayon buried a triple; Antic stayed active with a dish to Josh Powell for a slam. Hickman nailed a three and Ohayon went through the Reds’ defense for a layup – after a friendly roll on the rim – and foul. The visitors led 8-15 at the TV timeout. Powell soared to reject Hickman at the rim, but the Reds continued to struggle at the other end. 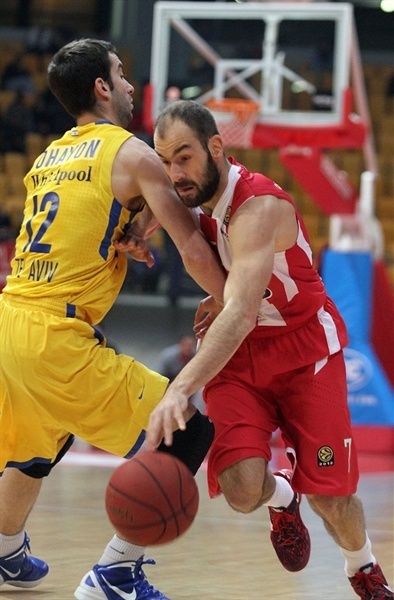 Spanoulis ended a three-minute scoreless spell for the hosts with a mid-range jumper. 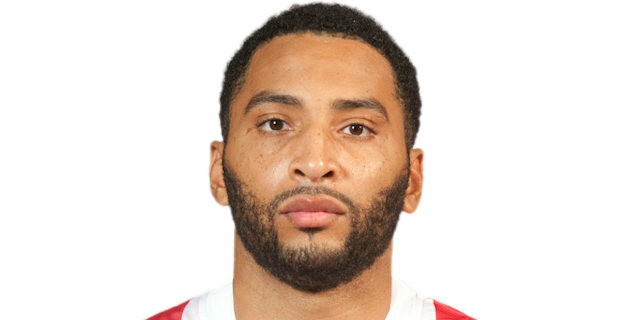 Powell came off with an undisclosed injury and went straight to the locker room. Kostas Papanikolaou trimmed the deficit to 3 before Logan knocked down a triple for Macccabi. Logan’s second three – a bank shot in the closing seconds of the quarter – made it 13-21 through 10 minutes. James dunked early in the second quarter to give Maccabi its first double-digit lead. Powell returned to the bench wearing a sling, signaling that Giorgi Shermadini would need to play big minutes for the hosts. Logan penetrated to cap a 1-10 Maccabi run. Papanikolaou scored, but for the most part the action revolved around strong defensive showings. Ohayon found Guy Pnini on an inbounds play to make it 15-27 midway through the quarter. Even Pnini’s unsportsmanlike foul on Papanikolaou failed to rally the hosts; a Smith triple put Maccabi up by 14. Spanoulis came alive with threes on consecutive possessions, but Hickman and Logan were up to the challenge. Law used a pretty penetration move to claw 2 back for Olympiacos, but a Logan triple at the other end made it 23-38. Logan silenced the arena with his fourth three-pointer en route to a 23-41 Maccabi lead at the break. sSloukas tried to ignite the hosts' comeback with a three-pointer immediately after the break. Hickman buried a six-meter jumper but Spanoulis split free throws and downed a corner triple to get the crowd involved at 30-43. James made 1 of 2 foul shots, but a tip-in by Hines and a put-back basket by Spanoulis forced Maccabi to call timeout at 34-44. James kept Maccabi rolling with some rebounds and 2 points from the line. 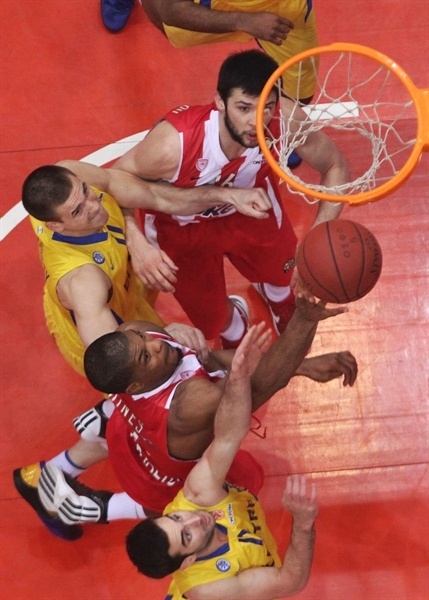 After Spanoulis gifted Kyle Hines a layup, Shermadini rejected James and then got the arena singing again with a slam. However 4 straight Hickman points put the visitors ahead 38-50 midway through the quarter. Hickman and Pnini added more free throws as the lead swelled to 15. Spanoulis looked to turn things around with free throws, a steal and a layup, but Logan silenced the crowd with a long jumper. 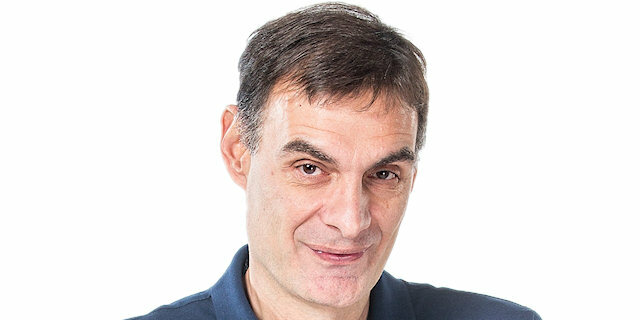 However Stratos Perperoglou fired them back again with a three and Law added another to trim the deficit to 49-56 through three quarters. Shermadini scored inside and Perperoglou added a jumper to cap a 14-2 ruin and bring the Reds right back into the game, down 3. Devin Smith countered with a deep three to make it 53-59. Law and Smith traded scores in the paint, the former with a pretty move and the latter with a tip-in. James scored in the paint to give Maccabi some fresh air, 55-63, midway through the quarter. Hines stepped up with a power layup and a huge block on Smith which allowed Sloukas to strike from downtown and fire up the crowd at 60-63. James scored down low off an inbound pass, but Papanikolaou kept the Reds within 62-65 with 3:34 left. Maccabi could not find open shots, but got three consecutive defensive stops at the other end. Smith, forced into a bad shot, beat the shot clock with an eight-meter three-pointer that silenced the crowd, 62-68, with 1:36 to go. 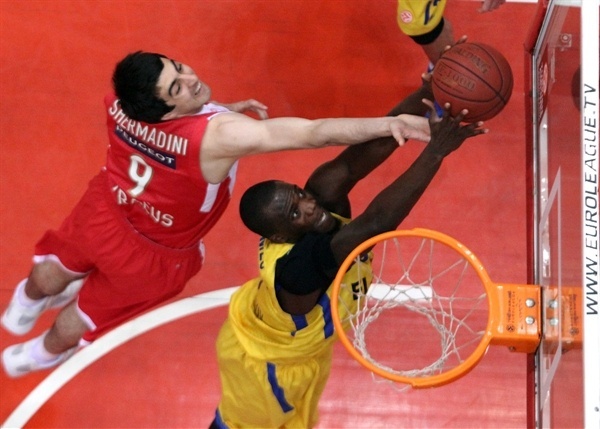 Maccabi got the ball back after an Olympiacos turnover and a driving layup by Hickman made it 62-70. Olympiacos kept trying, and free throws by Spanoulis and a three from Law made it 67-70 with 18 seconds left. The hosts sent Hickman to the line, where he split free throws. 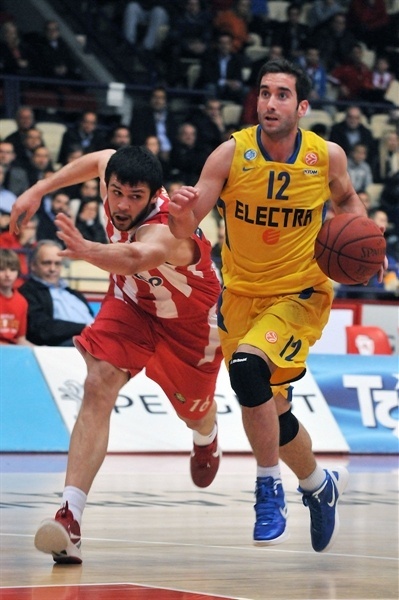 However a James steal away from Spanoulis set up Logan for a fast break layup to ice the win, 67-73. "It was a game with two different faces. We played terribly and with the wrong philosophy in the first half, which was our worst of the season, and we threw it away. Then we improved our defense and we came very close to getting the win, but the three-pointer made by Devin Smith from almost nine meters killed us. Before that, we missed three opportunities and this is an issue. We are not playing well and the team is affected by the injuries, because some of our players have no rest. I congratulate my players for their effort in the second half, but we have to realize that 20 minutes are not enough. Now we have to win the two remaining games in order to make it to the playoffs and get away the pressure. We are guilty, we are the ones to correct the situation. I think that when we play at home, the pressure goes up and we are not ready. Our results on the road are better and this is a proof." "We came today determined to win the game and we did it. We played an amazing first half, maybe our best this season, and not less important we knew how to withstand the pressure of the second half and we stood against a strong and talented team, which needed the win just as much as we did. 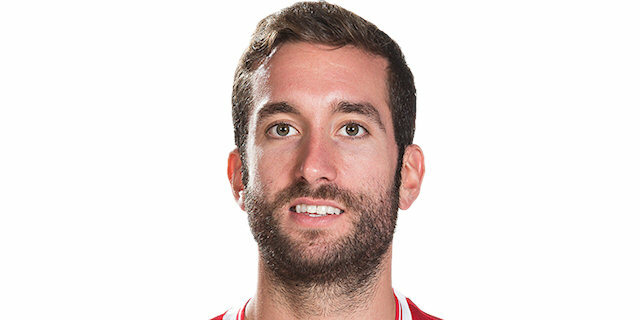 The whole club deserves credit. We prepared the right way. We came with confidence and we head home with an important win. Our job is not over. We must keep our feet on the ground, prepare ourselves and word hard until the last moment. " "They hit big shots and they killed us that way. In the first half we played very bad, but after that we improved our game. We were very close to making it, but Devin Smith scored some big shots and Shawn James blocked some of ours and Maccabi beat us. We are not disappointed, the road is still open, but we have to play much better and get the victories we need." "We gave all our hearts on the floor. This is one of the great comebacks. We started the game the way we had planned, we were very consistent and after a half like that, it’s hard to lose. Our coaches deserve credit for preparing us so well for the game and of course to my teammates, who gave great performances."